Dear customers, we are particularly attentive to the quality of all the products we offer. Today's market are full of low-quality products and copies of authentic BlackBerry spare parts and accessories. Note, disappointment of poor quality lasts much longer than the joy of low prices. The quality for us — priority. We choose best suppliers from the US and Europe for BlackBerry accessories, producers of original parts; and provide a high level of service. Our policy: to explicitly specify the origin and the manufacturer, separate original products and copy ones, new and used goods, and provide customer to choose based on full information. Even perfect production can occur defective items, and some of them are identified after the purchase only. In such cases we always deal in favor of the client. Our policy: we provide a warranty on all products. Warranty on all smartphones purchased in our store, including Refurbished (renewed) — 1 year. Warranty for services, spare parts, batteries and chargers — 6 months; on the headset, holders, cables, adapters, memory cards, cases and other accessories for BlackBerry — 1 month. The warranty on all copy (not authentic) accessories — 1 month. Used goods warranty is the same as for the new ones. In the event of a warranty case we will eliminate the defect free of charge (we'll repair), or if it is impossible — we change the defected product. You need to have proof of purchase in our store. Any document, a check or a payment system reference number. This product must not have physical damage, exposed to moisture, and no violation of other operating conditions allowed (including usage of non-original batteries, chargers and other accessories with your smartphone). This product should not be disassembled or repair attempts by third parties. The software installed on the device must be official. You need to deliver (to ship) the goods back to us. If possible, include the complete packaging, including manuals, and other accessories accompanying the goods. Under no circumstances will we be liable for any loss or damage (including, without limitation, cases of loss of profits, business interruption, loss of business information or other data, or other financial loss, injury or damage of any other kind) associated with the use or inability to use the purchased goods or services. Standard warranty: focus on compliance with legislation. That usually means that the warranty services will be transferred to third-parties service centers. As a result, the device warranty service will be covered in the longer term. Consultation on additional technical issues are not included in the standard warranty. Extended warranty: focus on customer needs. Diagnosis and repair will be performed by specialists of our service center, and we have many parts for repair in stock. In some cases (keyboard fault, screen, camera or other components) warranty services are performed during one day, and, in any case, service time is reduced to the minimum of possible. Extended warranty also means customers advice on related issues. Our policy: to provide customer choice of warranty, keeping the balance of price and an individual approach. In any case, warranty service is free when terms of the guarantee fit. Sometimes it happens that a product is good, but you change your mind or product do not fit, or want to exchange product to other one. We understand! Our policy: You can return the goods and get full refund or exchange to other goods, considering difference in price, within 15 days of purchase. Product is unused and look is fully preserved (package should not be opened, the protective films are kept, there are no damages). You must return the complete packaging, including manuals, and other accessories accompanying the goods. Delivery or any kind of related services (for example, contacts transfer from another device) will not be refunded. You deliver goods back to us and pay for shipping. You are currently viewing our site via a secure HTTPS-protocol, ensured by your web browser (usually a closed padlock icon). This means data exchange between your computer and our server are safe and can not be intercepted by third parties. Secure Payments carried out through PayPal gateway, including payment with credit cards, and guaranteed by PayPal. Our policy: Customer protection is a priority. International customers assured that orders will be shipped — we'll provide a tracking number for each parcel. 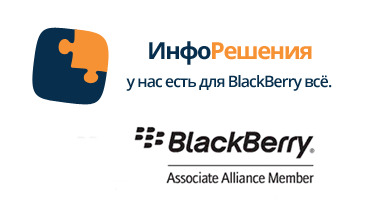 We work since 2009, got BlackBerry Associate Alliance Member status, and have already received a lot of positive feedback from customers. In addition, when you pay PayPal, the transaction is protected by a company with a worldwide reputation. Legal information on InfoResheniya, ltd..
Our mission is promote BlackBerry brand over the World, supporting current users of BlackBerry devices, as well as advise who are interested in. InfoResheniya — is the widest the range of accessories, parts and services over the World. We always offer solutions. We love BlackBerry. Your opinion is very important for us. We work for you, so please help us to follow the right direction through feedback, reviews and suggestions. Our policy: we are open for discussions. Contact InfoResheniya's Customer Service. Please try being objective. We are attentive to each request.